I recently ran out of cleansing oil and I decided I wanted to try a drug store version before opening my back up of Banila Co - Clean It Zero Cleansing Balm. When I went into Shoppers Drug Mart, I had a hard time finding it on the shelves. At least a "drug store" version, and not one of the higher end brands that they carry. 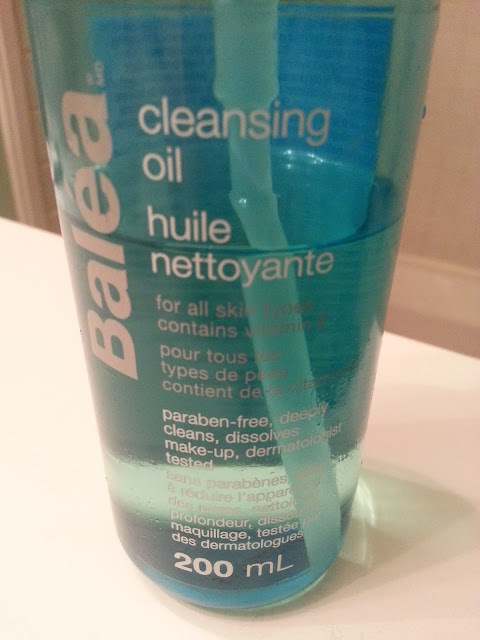 My options were limited to this Balea Cleansing Oil, or Burt's Bees. I knew I liked the Burt's Bees version, but I didn't want to spend $17 on it at the time, so I chose the Balea. 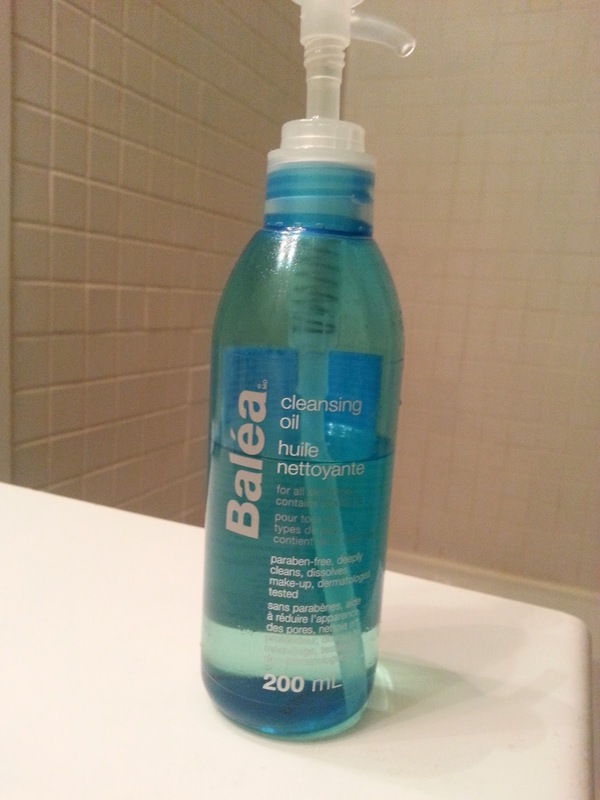 Balea is exclusive to Shoppers Drug Mart. It is a range of pampering and body-beautifying products including everything from bath, body and hair care to moisturizer and anti-ageing allies. This cleansing oil is for all skin types, and contains Vitamin E. It is also paraben-free, deeply cleans, dissolves make-up, and is dermatologist tested. It also is made up of quite a few oils, which I will highlight next. Balea Cleansing Oil is enriched with olive and jojoba oil to dissolve make-up and remove impurities without stripping skin of its natural oils. It deeply, yet gently cleanses skin without leaving it feeling oily; only soft, fresh and radiant. 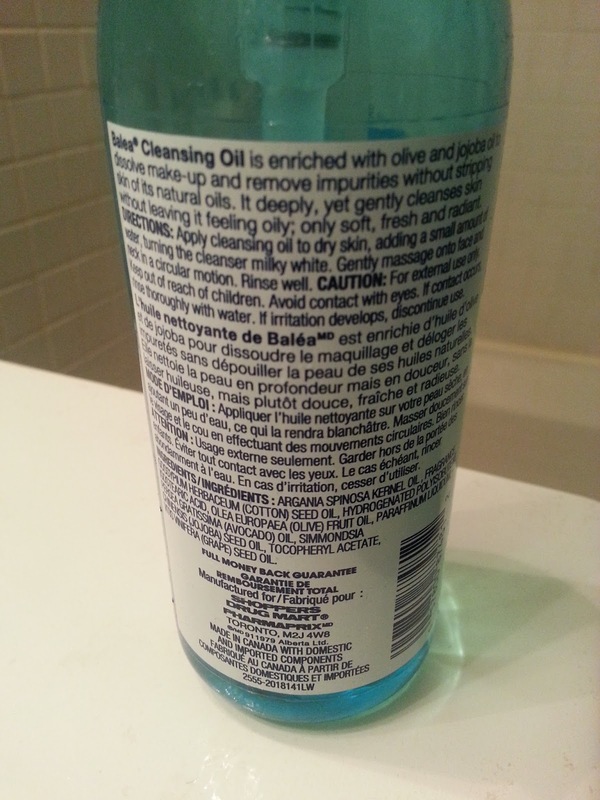 Directions: Apply cleansing oil to dry skin, adding a small amount of water, turning the cleanser milky white. Gently massage onto face neck in a circular motion. Rinse well. First, I have to say this oil comes out pretty quickly once you press down, so make sure you have your hand very close to the spout, or else it will fly everywhere! It comes out pretty watery, but once applied to the face, it feels super thick. I will usually pump one, to one and a half pumps into my hand, apply it to my face in circular motions, and then add the water. I find this doesn't get milky white, no matter how much water I apply, or how much I massage my face. Now after reading the directions, I'm not sure if I'm applying it wrong and I'm supposed to be doing the water/oil in my hands first and making that creamy then apply to my face, or I am doing it right but it's just not working on my face. Hmm.. Anyway, like I mentioned above, the oil feels thick on my skin. If I'm washing my face in the sink, it takes quite a bit of time to remove the oil from my face, and I usually get fed up and just add my foaming cleanser after rinsing my face from the oil, to get the residue off. If I don't do this, it leaves an oily film on my face and it feels gross. This isn't a lightweight facial cleansing oil at all. I usually will use a cleanser after oil cleansing, but in this case, it's most definitely needed. It doesn't do the greatest job at removing my eye makeup. A lot of the times it will leave mascara under my eyes, and sometimes on my lashes themselves. I'm not a fan of this oil, and I wouldn't repurchase it. I wouldn't recommend it either. This is disappointing. I hope the drugstore brings out good cleaning oils soon. They used to have more of a selection, maybe I just wasn't seeing them in the proper area lol. I will take a look at a blog :) I love to connect with other bloggers!